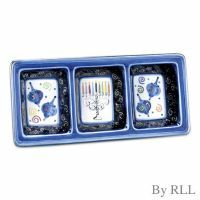 Beautiful 3-section hanukkah serving tray. unique design in each section. Perfect for hanukkah table. 13 1/2" x 16 1/2"